Crucified Barbara signs with Despotz Records! Swedish metal band Crucified Barbara has signed a recording and publishing deal with Despotz Records.
" The signing of Crucified Barbara fits perfectly in line with our strategy and goal to be a choice for Sweden's biggest rock bands, where they can work closely with a local Stockholm-based music company on a global basis with an international PR and distribution network. 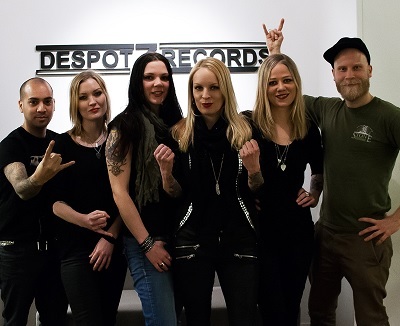 We are incredibly proud that these wonderfully gifted musicians chose to sign with Despotz "
- Ömer Akay, co founder and partner in Despotz Records. Crucified Barbara mixes thrash , sleaze and hard rock , and besided having played support act for, among others, In Flames, Sepultura , Motorhead , Backyard Babies , Doro, they also manage really well on their own and have been touring extensively in Europe. They have also visited Russia , Australia, and both South and North America. The band formed in 1998 in Stockholm with punk as a first inspiration and part of their music, and it can still be found as a presence in every step they take today, though they have evolved towards a harder, heavier and more contrast-filled rock sound. Their last album was ' The Midnight Chase ' which was released in 2012. They are currently in the studio completing their fourth album scheduled to be released in August 2014.